An Englishman in Colombia: A Good Start but a Slow End! A Good Start but a Slow End! I woke early, so decided to get going, it was 5.20am, the first order of the day, was to take the dogs for a walk, they have missed a few this week, due to heavy rain, and Pepe in particular doesn't like it at all. After a Coffee, it was time to get stuck in, the washing machine went on, and then I cleaned and mopped the three bathrooms, after which it was time for breakfast. I then did 20 minutes on the treadmill, increasing my speed a little to work up a sweat! It was then time to clean the swimming pool, the bottom was green after all the rain we have had over the last few days, it did clean a lot of it, but left a film on the bottom and the walls, I tried scrubbing it off with the pool brush, to little effect, I think it is some type of pollen, it is obviously very fine. Marcela thinks she can remove it by chemicals, and knows what to get, so we shall have to wait and see. By this time it was only 9.20am, and time to head to the workshop. There was a lot of measuring to do first, I have decided to do three drawers and three shelves in this unit, the drawers will be on a strange combination, because one of them will hold the firearms, and has to be readily accessible, without being in the way. I fitted the bottom brace for both sides, the one for the shelf being slightly recessed, so I could brad nail it, but that's fine, as the shelf will be sitting on top of it. I then installed the other drawer rails, the slides I made out of hardwood on this unit, as it will get a lot more use than the other. 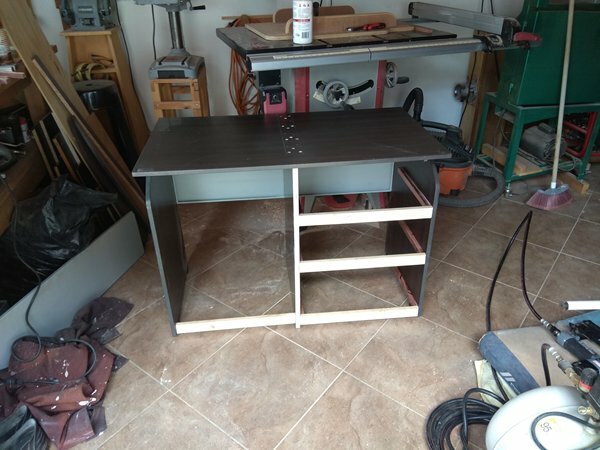 Tomorrow, I am home alone all day, as Marcela is working in the morning, then going off with her Mother to a family function for Mother's Day, I am staying out of the way, therefore I will be able to get on and make the drawers and shelves, and hopefully have that finished. This afternoon, I got on with another project, my Sister-in-law back in the UK has asked if will help her Class of Kids, who have been assigned the Colombian Football Team during the World Cup, because of her affiliation with here, so she has asked us to help with 'their' project, although I have a sneaky feeling I have been tagged to do their work for them hahaha! it's no problem, I guess it would help if I was a football fanatic like Marcela, but one Mother's Day is out of the way, she will have more time to help me, or at least oversee what I scribe.